I just posted a lesson I’ve used with various 5th grade classes as they were studying fractions and decimals. We used the Lego EV3 robots, and were able to complete the activity in an hour. Here’s how the activity works. Using a LEGO® MINDSTORMS® EV3 robot and a touch sensor, each group of students inputs a fraction. 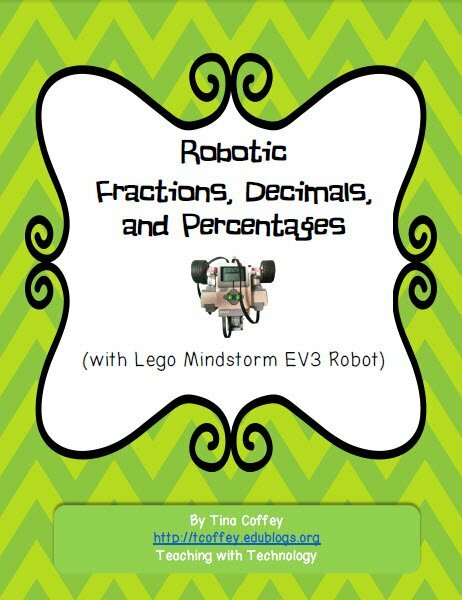 Then they convert the fraction into a decimal and a percentage using hand calculations, and double check their work using the EV3 robot. They observe the robot moving forward and record the distance it moves. Students learn that the distance moved is a fraction of the full distance, based on the fraction that they input. For instance, if they input ½, the robot moves half of the original distance. Using this information, students work backwards to compute the full distance. Groups then are challenged to move the robot as close as possible to a target distance by inputting a fraction into the EV3 bot. Four different challenges of increasing difficulty are available in this lesson. Most students complete 2 within an hour, but the extra are included for students who master the concepts quickly. The kids had a blast with this lesson and were fully engaged. I love how it really makes them think about fractions in a real sense, and that they have to draw on their understanding to figure out the challenges. Students in Mrs. White’s Kindergarten classes researched and made animals that started with the short vowel sound. They worked in small groups to build their creations, and then animated them with an app called ChatterPix Kids. Take a look at their zoo below! The projects are also posted on the Oak Grove Digital Archive, including Vowel Zoos from Mrs. Blankenship’s Class and Mrs. Fox’s Class. Students in Mrs. Sharp’s and Mrs. Downey’s Math and Writing classes used Legos to practice skills! First, they created lego houses based on a STEM activity created by Mrs. Downey. They found the area and perimeter of each of the rooms in their houses, and made sure to include at least one simple machine and working light. Here’s what the students created. They only had one class period to write and film their trailers! The Journey from elemitrt on Vimeo. The Cabin from elemitrt on Vimeo. Super Family from elemitrt on Vimeo. Summer’s Here from elemitrt on Vimeo. Creepy Connie from elemitrt on Vimeo. Check Out their Final Lego Movie Blog Posts here! Students in Mrs. Clapper’s class used the Pic Collage app on the iPads to create an ABC book. They were each assigned a letter (a few did two), and then they took pictures of things in the classroom that started with that letter. They were so cute! Here’s a few examples. I can’t post them all because most had students names and pictures on them. If you want to see all the letters, though, check with Mrs. Clapper or I. We’d love to show you!